The new Savills Live/Work Index has ranked Singapore the world’s sixth most expensive city for companies to locate employees, a position held since 2008. The index measures the total costs per employee of renting living and working space on a US dollar basis in 12 world cities. In Singapore, the combined cost of renting residential and office space per employee per year amounted to US$74,890 in June 2014. Although the housing market here has slowed with prices dropping 4.2 percent in the first six months of 2014, residential values have increased 44.6 percent over the last five years, according to Savills. 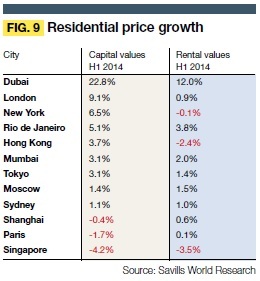 The report stated that residential rents have fallen 3.5 percent in H1 2014, but climbed 4.6 percent since 2008. On the other hand, while work costs have risen sharply with office rents growing 7.3 percent in the first half, this is still around 31 percent below 2008’s level. “Fluctuations in total live/work costs reflect not only the strength of a city’s residential and office markets and occupier taxes and costs, measured at a local level, but also the impact of fluctuating exchange rates on the cost of doing business on a world stage,” Savills said. Meanwhile, London has become the world’s most expensive city for companies to locate employees, overtaking Hong Kong, which had previously topped the ranking for an unbroken five-year period. New York and Paris complete the pack of four leading cities, where the combined costs of renting residential and office space top US$100,000 per employee per year. This entry was posted in General, Property Market / Real Estate and tagged Live/Work Index, Office Space, residential property, Singapore Property. Bookmark the permalink.